A household fire is arguably one of the most traumatic experiences anyone can go through. It can be even more traumatic when there are children, pets, and older family members to worry about. Although you may not necessarily experience a house fire in your lifetime, preparation, practice, and prevention will go a long way to making sure it never happens. Safety with matches, BBQ lighters, etc. There is no reason why every bedroom in the home shouldn’t be equipped with a working smoke detector. Check your batteries every spring and fall and replace your detectors every 10 years or so. Ensure that your kitchen is equipped with an appropriate fire extinguisher and that it is not expired. If you have a home security system, make sure that it is properly set up to call your closest fire station in case of an emergency. Smoke detectors cost almost nothing to install and take almost no effort to maintain. However, an alarm from a smoke detector has saved countless lives all over the world. Building an evacuation plan for the whole family guarantees that everyone is on the same page in case of an emergency. Sit down with your kids and draw out a map of the house using fun colours so that they are happy to participate. For every bedroom and every family member, create individual escape routes. Be sure to practice evacuating until everyone is out of the house and at the designated meeting place in record time. For upstairs bedrooms, consider purchasing window ladders for easy escape. Everyone loves to light candles at dinner or in the tub, but where we see relaxing accoutrements, our kids see opportunities to play with fire. While teaching kids about fire safety is one thing, the safest way to avoid a disaster is to simply keep temptation out of reach. Ensure that all lighting instruments and flammable items are safely stowed away where kids can’t find them. The kitchen is the heart of the home, but there are so many ways a child can surreptitiously ignite a spark. The love of pushing buttons and playing with knobs can cause your kid to turn the stove on while you’re not looking. Infants who are just learning to crawl may pull themselves up by a loose oven door and pull the whole thing open. Kids learn pretty quickly that heat is painful, but we don’t want them learning the hard way. The rule of thumb is to never leave a hot appliance on unattended and always make sure your child safety features are installed and engaged. 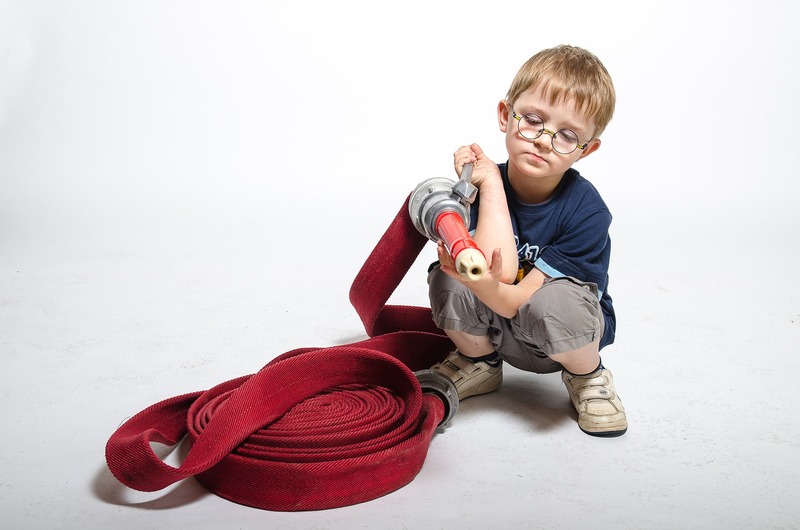 Protect your home and your children by teaching them invaluable lessons about fire safety. Prevention, preparedness, and practice can go a long way in ensuring your family never has to suffer from fire and smoke damage.